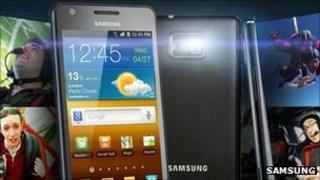 Samsung has been banned from selling three models of its Galaxy smartphones in a number of European countries. The preliminary injunction was handed down by a court in the Netherlands after Apple filed a claim for patent infringement. It claimed that Samsung had copied technology owned by Apple relating to the way photos are displayed on mobile devices. The embargo is due to come into effect in seven weeks. A district court in the Hague upheld Apple's claim concerning one specific patent - EP 2059868 - which outlines an interface for viewing and navigating photographs on a touchscreen phone. However, the judge rejected several other patent issues, as well as Apple's claim that Samsung had stolen many of its design ideas. The ruling covers the Galaxy S, Galaxy S II and Galaxy Ace models. It does not prohibit sales of the Samsung Galaxy Tab, which had been mentioned in the original lawsuit. Despite the impending embargo, Samsung welcomed the judgement. In a statement, the company said: "Today's ruling is an affirmation that the Galaxy range of products is innovative and distinctive. "With regard to the single infringement cited in the ruling, we will take all possible measures including legal action to ensure that there is no disruption in the availability of our Galaxy smartphones to Dutch consumers." The company appears to believe that the ruling only directly restricts the sale of Galaxy smartphones in the Netherlands. "This ruling is not expected to affect sales in other European markets," the statement continued. Like many technology firms, Samsung uses the Netherlands to import most of its goods into the European Union. The interim injunction prohibits sale of devices by three of the company's Dutch subsidiaries to the UK, France, Germany, Finland, Ireland, Liechtenstein, Luxembourg, Monaco, Sweden and Switzerland. Patent litigation blogger Florian Mueller said that Samsung's distribution model meant the ruling effectively amounts to a de facto European-wide ban. "If Samsung's Korean parent company wants to exercise its freedom to ship into other European countries despite this injunction, it will have to reorganize its logistics chain in Europe accordingly," wrote Mr Mueller. Samsung's photo management system is, in turn, part of Google's Android operating system, suggesting that Apple may be able to take similar action against other handset manufacturers. For that reason, it seems likely that Google may now have to issue an urgent update to Android. Samsung and its mobile devices have been the subject of an aggressive campaign of litigation by Apple, which has also secured a German embargo on sales of the Galaxy Tab 10.1. However, it is not the only major electronics firm embroiled in such action. Google, Motorola, Microsoft and LG are among the major manufacturers which have gone to court to assert their intellectual property rights.